I have a confession to make, Co-Optimus readers. There is a truly excellent co-op game that I have neglected to play until only recently. My status as editor and resident classic gaming guru is in serious jeapordy. How could I have put off buying a game with "Retro" in the title for so long? How foolish it was for me to overlook Geometry Wars Retro Evolved 2! For more than a year, the demo for Geometry Wars sat on my hard drive, oh so lonesome and in need of attention. As 20 gig hard drives full of Rock Band tunes often do, my drive was in need of some free space. After deleting demos for Bolt and RE5, I noticed Geometry Wars 2 on the list. I had totally forgotten about it, and I hovered over the delete button for a moment, but then I remembered Nick's praise of the game, and decided to take another look. I played the demo for just a few minutes, and then one of the kids walked by. Since there is no co-op in the demo (and why not, I have to ask? ), and I had some leftover MS points, I threw caution to the wind and purchased the full version. Shortly thereafter, my mind was blown. My kids and I spent the next two hours glued to the screen. We would play a game mode in co-op for a while, then pass the controller around in single player to unlock the next mode as soon as possible. We must have played for three hours straight, with no pauses, interruptions, or breaks. We even decided to go for some of the achievements that first day. 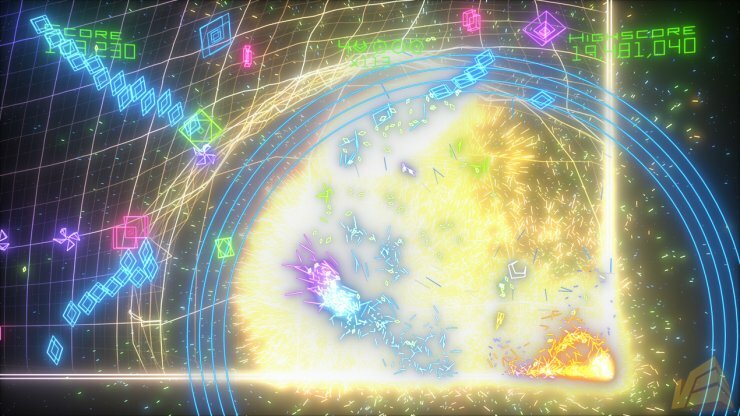 For the record, Geometry Wars 2 has some of the most well thought out cheevies of any game I can remember. Not only are there rewards for standard milestones, but some make you pkay the game in entirely new ways. Wax on and wax off are probably the best example. There's no way you would try to play that way unless there was the achievement, but its really, totally fun trying. We laughed, we high fived, we howled in frustration. It was one of the best gaming sessions we've had in a long while. 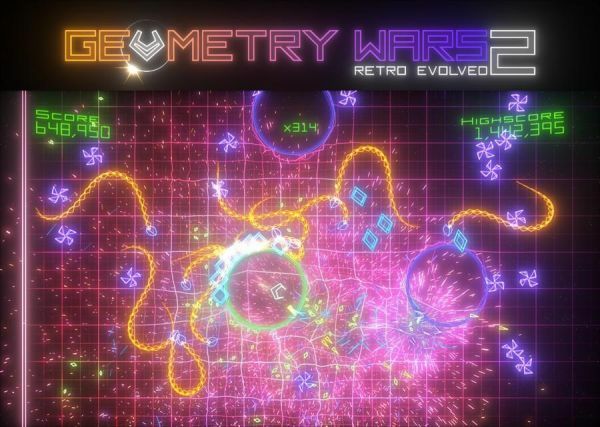 Geometry Wars 2: Retro Evolved 4-player Co-op! Page created in 0.3661 seconds.